Want to learn about an easy and efficient church fundraiser? We know the hardest part about fundraising is starting! 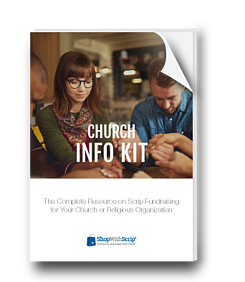 That's why we put together this short Church Scrip Fundraising Info Kit to give you what you need to know in order to get the ball rolling. Scrip has helped get our church debt down without hurting our pockets. I love the reloads because I am always ready to shop and help the church! It is convenient for me but most importantly I am helping pay towards the debt on our 4 year old church. It is good to know you are contributing extra besides in the collection basket. ShopWithScrip has been wonderful for our church. We buy gift cards and the money we earn goes in our child's youth account to help pay for mission trips for the kids.